____Susanna Hertrich is a German artist living and working in Basel, Switzerland and Berlin, Germany. She studied at the Peter Behrens School of Art in Düsseldorf (FH-D), Tokyo University of the Arts in Japan and the Royal College of Art in London. She received a diploma in Visual Communication from FH-D in 1998 and completed a Masters degree at the Royal College of Art in 2008. 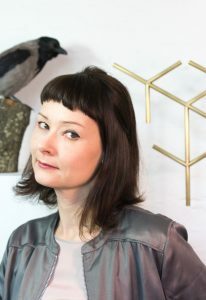 Her practice is situated at the intersection of conceptual design and contemporary art and she combines a range of different media, including devices, sculpture, photography, video, and graphics to stage narrations that often focus on overlooked and uncanny dimensions within technological environments. Susanna is a recipient of numerous grants and was an invited artist in residence at the Goethe Institute’s Villa Kamogawa in Kyoto (2015), Tsinghua University Art & Science Media Laboratory in Beijing (2012) and Tokyo Wonder Site (2012). Along with her artistic practice, she is a researcher at the Institute of Experimental Design and Media Cultures (ixdm) at the Academy of Art and Design in Basel FHNW, Switzerland in the project Sensorium of Animals. Current and past group exhibitions include “Hello, Robot” a travelling exhibition by Vitra Design Museum; Boston Center for the Arts; Dorsky Gallery, New York; HEK, Basel; Bureau Europa, Maastricht; HKW Haus der Kulturen der Welt, Berlin; CAFA Art Museum, Beijing; Marta Herford; FACT, Liverpool among many others. Susanna has fulfilled teaching positions at Chiba University in Japan, Anhalt University in Dessau, University of the Arts Berlin, Academy of Art and Design in Basel FHNW and Bergen Academy of Art & Design in Norway KHiB.